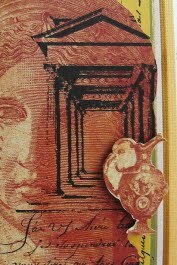 Vada's Blog Stamp Inks and Paper : GC 69# Chestnut Theme Challenge “Ancient Ages”. Over at Gingersnap Creations, we have a new challenge going on. It’s Ancient Ages and “Think of the fabulous inspiration that can arise from the magnificent ancient civilizations of Greece, Rome, Egypt, China, and Mesopotamia. Go Aztec or Mayan for or Aboriginal North American for a connection with the ancient Americas. Why not go all the way back to the fabulous art of the Stone Age? Get historical with your art this month. So come over and join us. For my card I used stamps from ISC, Art by Moonlight, Artful Illusions and Hero Arts. My paper is from Graphic 45. 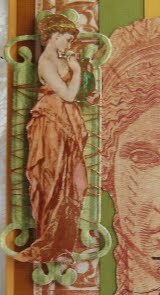 The lady was stamped on glossy and colored with chalks. Labels: Gingersnap Creations Challenge, Hero Arts. Artful Illusions. Love what you achieved with this challenge! Awesome the way you used the tag for placement of the lady! Beautiful colors and card! Love it! Absolutely stunning, Vada! Love all your great details! Absolutely delightful, I love the lady and how you coloured the image. 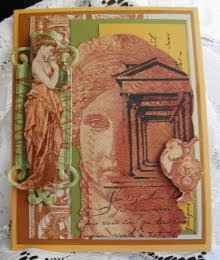 Gorgeous Vada, I love all the dimension you created on your lovely card! Vada, love this card, the colors, the images just everything about it!